The notices of a vacancy for a District and County Councillor have now been published. Link here. Following the sad news of the death of deputy leader of East Northamptonshire Council, Cllr Glenn Harwood MBE, a book of condolence has been opened to the public. Cllr Steven North, Leader of ENC, is inviting residents who wish to pay their respects to sign the book. Parish Appraisal is on its way! 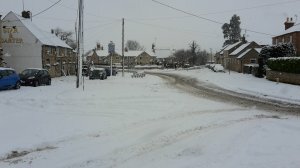 The Parish Appraisal, the survey carried out every 7 years or so by the Parish Council, will be arriving through your letterbox shortly. This is an opportunity for you to guide what local services the Council should provide or support. Creatifica Associates Ltd has been appointed to undertake the grass cutting for the 2018 season, starting from 1st January 2018. The winning tender included additional cuts compared to the other bidders considered at the November Council meeting. The service of thanksgiving for the life of Cllr Glenn Harwood MBE will be held at St Mary's church, Higham Ferrers, on Tuesday 12th December @ 14:00, with refreshments in the Bede House afterwards. 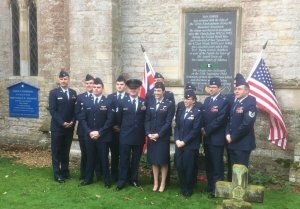 A crew lead by Capt Mike Meeks, 32nd Air Refuelling Squadron, 305th AMW from McGuire AFB, NJ, USA, stopped over in England to attend the Remembrance Service, and laid a wreath at the Church Tower memorial to the 305th BG(H). The wreath layer was M/Sgt Jeremy Becnel, who is a Senior Boom Operator.